Habit: Annual, perennial herb, unarmed, glabrous or hairy (glandular), generally rhizomed. Stem: sprawling, climbing, or erect; angled, flanged, or winged. Leaf: generally even-1-pinnate; stipules persistent, upper lobe > lower; main axis ending as tendril or short bristle; leaflets +- rolled in bud, 0--16 (if 0, stipules leaflet-like), +- opposite or alternate, linear to widely ovate. Inflorescence: raceme, generally axillary, 1--many-flowered. Flower: upper calyx lobes generally <, wider than lower; corolla 8--30 mm, pink-purple or pale, occasionally white or yellow; 9 filaments fused, 1 free; style +- flat, puberulent near +- middle for +- 1/3--1/2 adaxially. Fruit: dehiscent, oblong, +- flat. Species In Genus: +- 150 species: temperate North America, South America, Mediterranean, Eurasia. Etymology: (Ancient Greek name) Toxicity: Seeds of most alien species. TOXIC to humans, livestock (especially horses). Note: Some species variable, intergrading with others; some hybridization probable. Lathyrus aphaca L. (leaflets 0, stipules leaflet-like) not naturalized in California. Unabridged Reference: Broich 1987 Syst Bot 12:139--153; Broich 2007 Madroño 54:63--71; Kenicer et al. 2005 Amer J Bot 92: 1199--1209. Habit: Perennial herb, glandular-puberulent. Stem: often strongly angled or flanged, generally not winged. Leaf: stipules small, narrow; leaflets +- 14--16, generally subopposite to alternate, 3--5 cm, ovate to lanceolate, conspicuously gland-dotted abaxially; tendril branched, coiled. Inflorescence: 5--12-flowered. Flower: calyx tube > upper lobes, +- <= lower; corolla 10--14 mm, lavender to purple. Fruit: gland-dotted. Chromosomes: 2n=14. 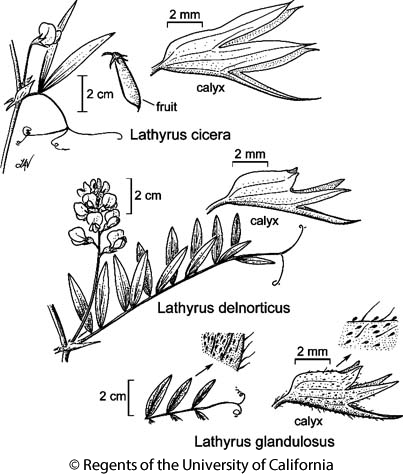 Citation for this treatment: Kelly Steele & Duane Isely 2012, Lathyrus glandulosus, in Jepson Flora Project (eds.) Jepson eFlora, http://ucjeps.berkeley.edu/eflora/eflora_display.php?tid=30300, accessed on April 21, 2019. Citation for the whole project: Jepson Flora Project (eds.) 2019, Jepson eFlora, http://ucjeps.berkeley.edu/eflora/, accessed on April 21, 2019. No expert verified images found for Lathyrus glandulosus. NCoR (Humboldt, n Mendocino cos.). Markers link to CCH specimen records. Yellow markers indicate records that may provide evidence for eFlora range revision or may have georeferencing or identification issues. Purple markers indicate specimens collected from a garden, greenhouse, or other non-wild location.